Stark County was established on February 13, 1808 and named in honor of the oldest surviving general of the Revolutionary War, General John Stark. As of 2016, Stark County has an estimated population of 373,612 people and a land area of 576 square miles or 371,193.9 acres. The U.S. Census ranks Stark County as the 8th largest out of 88 counties in Ohio. Stark County is home to the communities of Alliance, Canal Fulton, Canton, Jackson Township, Lake Township, Louisville, Massillon, Minerva and North Canton. Located just 60 miles south of Cleveland, Stark County offers most of the amenities of a large city with the advantages of a smaller city. The lower cost of living provides significant advantages to businesses and their employees, and more affordable housing. The Canton-Massillon-Alliance area hosts excellent schools and hospital facilities, and recreation opportunities like access to U.S. National Parks, large lakes for fishing and boating, cultural events and shopping. Stark County is nationally recognized for serving as the location of the NFL Professional Football Hall of Fame. The area is also the world headquarters for several large corporations including The Timken Company, TimkenSteel, Diebold Nixdorf Corporation, the Kenan Advantage Group, Shearer’s Foods and the new headquarters for LG Fuel Cell Systems, Inc. The county is home to hundreds of other service and manufacturing companies that have all recognized the business edge they get from Stark County’s excellent accessibility to the U.S. market and its lower cost of living. Growing companies like operating in Stark County for several reasons including the availability of a skilled workforce, its transportation hub and low-cost utilities. It is is also home to six colleges and universities that collaborate with businesses to help them innovate and adapt, train and prepare employees for jobs in emerging technologies. Stark County has a growing reputation for its strong partnerships with the economic development community, education and private industry. Those partnerships have a proven track record of advocating for tax breaks, state and federal support funding, and other financial resources to help business succeed and grow here. The 2016 Ohio County Profiles, prepared by the State Office of Research, presents demographic and economic statistics associated with business and industry activity, and the amenities and services for Ohio and its 88 counties. The publication provides users with a current overview of Ohio that may be used in business decisions or policy making by business developers, researchers, planners, government leaders and social service agencies as well as the general public. The Official Stark County Profile can be accessed by clicking on the map of Stark County. All of those successes are great sources of strength and pride for our area, but we have no intention of resting on our laurels. Stark County is well positioned to embrace the future, and we eagerly move forward into the new economy focused on companies in advanced manufacturing and new emerging technologies like fuel cells, wind energy and oil shale exploration and development. Ohio is one of the few places in the world where all phases of fuel cell development take place, from research and development, to component supply, to final product manufacturing. The state is poised to lead the nation's fuel cell industry as a top research and manufacturing hub. Stark County is home to LG Fuel Cell Systems, Inc. which represents a joint venture between LG and Rolls Royce. LG Fuel Cell Systems has its global headquarters on the campus of Stark State College in Jackson Township, Ohio. Thanks to improved drilling techniques and technology, previously unreachable underground reserves of natural gas have been discovered in vast Marcellus and Utica shale deposits in Ohio, which has surely impacted the Stark County economy. Extraction of that oil and gas resource is still in its early stages, but it holds the promise to provide an economic boom in the state similar to what has occurred in states like Pennsylvania, North Dakota and Texas. To date, the major holders of Utica shale leasing rights in Ohio include Chesapeake Energy, Enervest & EVEP, Chevron, Anadarko, Hess Corporation, SA, Devon Energy Production and Consol/CNX Gas. With their moves to Ohio, those companies also have attracted numerous oil and gas service companies, like Baker Hughes in Massillon, Ohio, as well as other engineering firms and well-field supply companies. Stark County is strategically located in Northeast Ohio which serves as the crossroads of the Eastern and Midwestern U.S. markets. Stark County’s network of highways provides easy access to other major Ohio cities and to the larger cities and markets of the Midwest and East Coast including Cleveland, Columbus, Cincinnati, Detroit, Indianapolis, Chicago, Pittsburgh, Buffalo, Philadelphia, New York City, Boston and Washington, D.C. Among the interstate highways providing access to the U.S. are included I-77, U.S. Route 30 that links to I-71, Interstate 76 near Akron and the Ohio Turnpike that links to I-76 and to I-80 to the East Coast. Additionally, the Akron-Canton Airport (CAK), located just west of I-77 between Canton and Akron, offers the lowest average airline fares in Ohio. CAK provides nonstop air service to 11 cities in the U.S. and access to the world with only one-stop. Akron-Canton Airport is in the midst of its 10-year, $110-million CAK 2018 Capital Improvement Plan. The plan is the most ambitious in the airport’s 62-year history and includes expanded parking lots, a wider entrance road, a spacious TSA security checkpoint, a customs and border patrol facility, an extended upper level concourse and the construction of the Port Green Industrial Park. Stark County is strategically located at the crossroads of the Eastern and Midwestern U.S. markets. When you locate in Ohio, you'll build a profitable business. A business-friendly tax environment is an absolute must in today’s economy. In Ohio, we’re doing something about it. And the state’s Commercial Activity Tax is a low .26% on gross receipts exceeding $1 million. 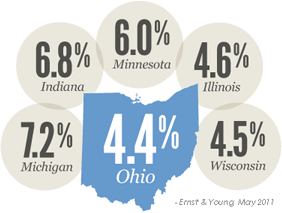 Ohio’s tax on new investment is the lowest in the Midwest, and EY research shows that our 4.4% effective rate ranks Ohio as the third friendliest tax environment in the nation.